Basic Life Support (Adult & Child) is an ideal course if you or your staff members work in a non-medical role such as in a primary care setting such as GP surgeries, Dental practices, or Community health centre. 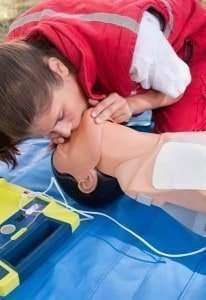 This 1/2 day (3 hours of guided learning) will give you and your staff members the confidence and the competence to be able to successfully manage an unconscious casualty, this casualty maybe still breathing or may have stopped breathing, but rest assured you and your staff members will have the necessary skillset to give the casualty lifesaving resuscitation and use an AED confidently and competently, and learn how to place the casualty into the recovery position whilst awaiting medical assistance. Also on this Basic Life Support (Adult & Child) course, you and your staff members will also learn how to successfully provide assistance to a casualty who is choking and have the confidence to give the appropriate treatment. Basic Life Support (Adult & Child) course is a regulated qualification approved by Ofqual and is accredited by Qualifications Network, and meets current requirements of UK Resuscitation Council too. Attendees will be required to demonstrate first aid procedures as they would in a real environment. This includes providing CPR to a casualty who is on the floor, therefore be physically capable of doing so.